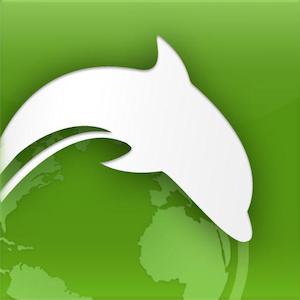 Dolphin Browser HD is a mobile browser for Android 2.0.1 and up. With over 250,000 downloads, it is the most popular browser on the Android market. The browser supports flash, HTML5, navigation with gestures and multi-touch zoom. It comes with a sidebar for tools and bookmarks, a speed dial in new tabs to quickly access your favorite websites, a smart address bar that auto-completes URLs, you can easily switch between mobile and desktop view of websites, and control a host of additional settings to fully customize your browsing experience. Does this sound like your kind of browser? In this article I will highlight the gesture navigation and guide you through the massive amount of settings you can control behind the scenes of this browser. I will also provide a general overview of Dolphin’s more standard features, many of which are mentioned above. Touchscreens are the most exciting characteristic of modern phones and tablets. Unfortunately, many apps don’t use the full potential of this key feature. While many functions can be controlled via intuitive use of touch buttons, some actions still require us to click our way through menus, much like we would do with an external mouse. This is where gesture navigation is more convenient and faster than clicking through menus. To access gesture navigation in Dolphin Browser HD, touch the hand symbol in the bottom left corner. You can then draw your gesture across the entire screen. To view all gestures and access gesture settings, touch the > Draw a gesture button in the bottom right corner whilst in gesture mode. Within gesture settings you can also add new gestures. Touch the respective button in the top right. Here you can add gestures for custom URLs, to find something specific on the page, select text, save page, zoom in or out, search, and many more actions. Each action comes with a recommended gesture, but you can also create your own. Dolphin Browser HD has a very simplistic interface and it does not look like much at first glance. However, through the browser settings you have access to a whole world of additional features and options. Click the > Android toolbar button highlighted in red in the screenshot below, then > More, and > Settings. The degrees of freedom in terms of customization and additional features is almost overwhelming. In fact, it provides the same amount of depth as a desktop browser. Within Dolphin settings, you can control basic preferences, such as default user agent (mobile or desktop view of websites), volume button action, screen orientation, net tab settings, and more. The page content settings give you access to your preferred site layout as in text size, default zoom, text encoding, image loading, or enabled scripts and plugins. These settings are highly valuable as it allows you to customize the browser not only to meet your personal preferences, but also to better operate within the limitations of your Android device. In data storage settings you can clear various stored browser data, for example the browser cache, HTML5 data, or Webzine cache. You can also change where downloaded files are saved, make a cache save to an SD card, or view advanced settings for individual websites. The privacy & security settings evolve around preferences for cookies, form data, passwords, location awareness, security warning, and browsing history. Under Backup & Restore you can backup and restore your entire browser settings, bookmarks, and web data to an SD card. You can also set a password for your backup. Here you can also import bookmarks from other browsers. Furthermore, you can control the settings for the Dolphin Browser HD Webzine, sign up for updates, reset the browser to default, access the about page, go through the setup wizard, and create or access your Dolphin account. Are you missing a key feature? Maybe there is an add-on for it! There are more than 60 add-ons available for Dolphin Browser HD. Many popular add-ons have paved the way for inbuilt features. A list of add-ons sorted by category and reviews for each can be found on the Dolphin Browser Blog. Dolphin offers a left-hand (bookmarks) and right-hand (toolbar) sidebar, which open by swiping the browser window to the right or left, respectively. The Toolbar is home to add-on buttons. Both these features find a home in new tabs and you can switch between them via two tabs embedded in the tab itself. Also see the list of Most Popular Features on the Dolphin Browser homepage for a commented overview. If you like this browser, also have a look at the 5 Must Have Add-Ons For The Dolphin Browser On Your Android Honeycomb Tablet 5 Must Have Add-Ons For The Dolphin Browser On Your Android Honeycomb Tablet 5 Must Have Add-Ons For The Dolphin Browser On Your Android Honeycomb Tablet Dolphin Browser HD is one of the most popular browsers for Google Android, a fast browser that sports a clean interface and provides quick and easy access to full screen mode. It supports tabs, bookmarks,... Read More . What is your favorite Android browser and if it’s not Dolphin Browser HD, how does it compare in your opinion? UC browser is better than Dolphin browser when it comes to saving images and faster downloads.So,I prefer UC. Always have used Dolphin from day one, thanks for letting me know I was missing so much. what about it's recent security issues? Back in October, Dolphin Browser HD was indeed found to record private user data to a server when using the Webzine feature. The developer responded immediately with an explanation, claiming no data had been saved and users had not been tracked.